First Listen: The Roots, 'undun' On their 13th album, Philadelphia's rap maestros reach new narrative and compositional heights. The Roots' undun comes out Dec. 6. 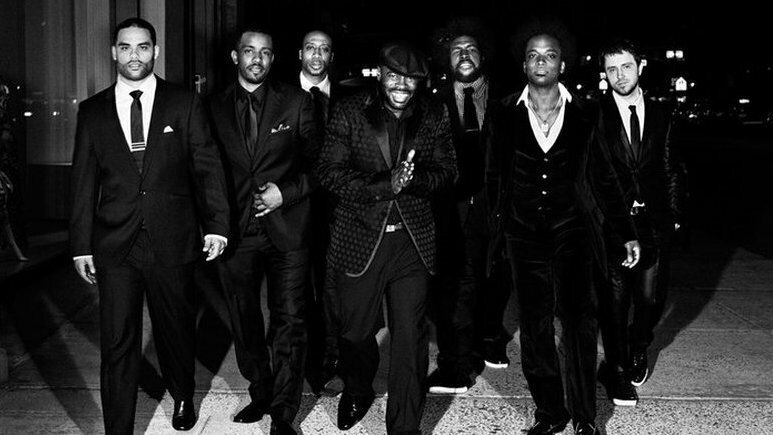 "And what I did came back to me eventually," narrator Redford Stephens, transcendently portrayed by Black Thought, posthumously intones in "Sleep," the first track from The Roots' 13th album undun. Death pervades undun; it follows Stephens, a poor kid from Philadelphia and victim to the drug trade, from the moment he surrenders himself to the game all the way to his inevitable end. Along the way, no verse is wasted, no optimism is spared; each line is like a shovelful of dirt on Redford's coffin. At 39 minutes, undun feels like a lifetime, because it is one. The album is gorgeously arranged by the incomparable ?uestlove, The Roots' expert bandleader and producer, whose recent projects include the "Philly Paris Lockdown," a reinterpretation of the works of the French impressionist composers Erik Satie, Claude Debussy and Maurice Ravel. On undun, ?uestlove renders the lush modality of these composers in the vibrant hues of early-'70s soul music; the eerie, ghostly outro of "Make My" sublimates the drug dealer's hopeless, nihilistic glory into misty Moog and starry synths in the vein of Stevie Wonder's "Superwoman (Where Were You When I Needed You?)." The record's most affecting element, however, is its lyricism, led with gimmick-less seriousness by Black Thought, a rapper whose storytelling is unencumbered by sophomoric jocularity or false cartoonishness. His desolation is unvarnished and striking in "I Remember," in which he darkly rhymes, "I drew a two of hearts from a deck of cards / A stock trick from my empty repertoire / Another hopeless story, never read at all / I'm better off looking for the end where the credits are." He's given fleeting respite from the stress of the drug trade in "Kool On," but is harshly pulled back to earth the next morning in "The OtherSide," where paranoia surrounds him again: "We obviously need to tone it down a bit / Running around town spending time like it's counterfeit." The album's guest spots are similarly purposeful. Producer Just Blaze's recent conquests with Drake and Rick Ross (among many) have made him ubiquitous on pop radio, but in "Stomp" he transforms the four-on-the-floor, tambourine-rattling beat into a plodding chain gang. Longtime Roots collaborator P.O.R.N., whose "Every thought is dark as a glass of Guinness" (in "The OtherSide") sounds like a combination of Curren$y and Malice of Clipse. In "One Time," Dice Raw issues a heartbreakingly dark verse on the predestination of his cursed life, asking, "I wonder when you die, do you hear harps and bagpipes? / If you ball on the other side of the crack pipe? / N----s learn math just to understand the crack price / then dive in headfirst like a jackknife." These features peak in "Tip the Scale," the most lush and affecting rumination of crack sales since Kanye West and Jon Brion's "Crack Music." The album ends with a short suite of pieces based on Sufjan Stevens' instrumental "Redford (For Yia-Yia & Pappou)" from his album Michigan; it even features the composer on piano. The ghostly backup vocals and muted horns perfectly match undun's spectral artfulness. Brilliantly, instead of transforming "Redford" into a functional sample, it's presented in state. ?uestlove treats "Redford" almost like a piece of movie music, accompanying the action rather than recapitulating it. The result is a cinematic moment waiting to be processed, fictionalized into hip-hop. It's as if the listener zoomed in beyond the safe narrative distance of the song and actually ended up in the movie. This movement of the suite is like a rap track under a microscope, the sample blown up so large that the beats that keep hip-hop as the frame of reference are a horizon enshrouded in fog. By the third act, Stephens has been replaced by DD Jackson in a careening duet with ?uestlove, whose long-cultivated drumming heft and precision play like fists through a plaster wall or bullet holes through a car door. Finally, credits roll over a sublime string quartet, mercifully for Black Thought's black thoughts — at least for a moment, before ?uestlove's meticulously arranged strings are silenced by the chilling, deathly growl of a struck piano. Black Thought has never been frivolous, but there's extra seriousness to his performance on this record that can only be explained by someone who truly knows him. "Redford is definitely compiled [from] five or six people that we've known from Philadelphia," ?uestlove told Spin magazine recently. "Tariq [a.k.a. Black Thought]'s entire family, his cousin and brothers, have literally all been this guy. Tariq is the only one that has escaped the fate that most of his family have encountered. The narrative definitely hits home with him more than any other member of the band."